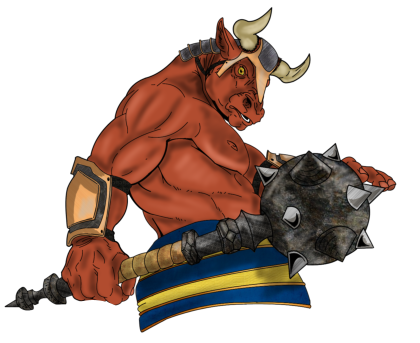 Rostam Stonemace is a tall Minotaur at 10’ 4" and has a body built like an giant warrior. What would surprise you the most is that Rostam is a scholar of fighting, and at just over 300 years old he is rather vicious, if you can anger him. At least when he is teased by his son, Zeelik, that he can’t win a fight before it starts. Rostam taught all his children one lesson: be polite but have a plan to kill everyone you meet. His skin is nearly dark red / tanned like desert rock and his hair as well. Although most people think it is from working at the forge with tools he made from copies of dwarven tools left behind from ancient times. Rostam studies fighting, weapons (he made Xerx’ses flail of prayers), construction (he made his own weapons when he passed his famous mace to his son), engineering, harmony, balance, writing. His philosophy is such that its highest form is to know when to sheath your weapon. Rostam outlived his mate whom bore him Zeelik Stonemace. 3 years after her passing he felt enough time had passed and began looking for a new mate. Xerx’ses mother was a fine guardian of the light and Priestess of Isis. It was decided 6 months later and they joined their households. Zeelik and Xerx’ses had become brothers. Rostam is fond of maces, hammers, and flails, but can use any weapon or improvised weapon. UPDATE: As co-chieftain of the Serinan tribe, and with the death of Zeelik, Rostam has now begun to wield Anzuroq, the stone rune mace once again.